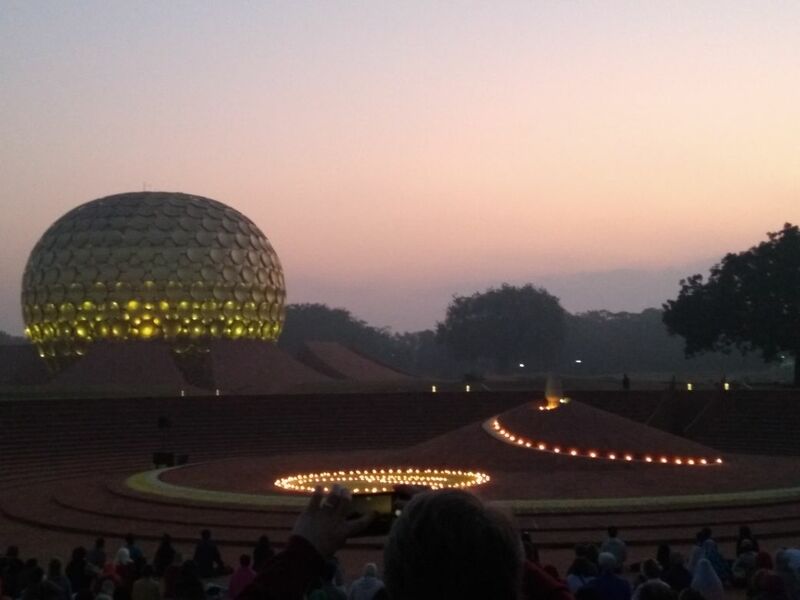 Auroville at 50: let's cheer and celebrate, there is no another Auroville! The intentional community of Auroville located in the states of Tamilnadu and Pondichery has come a long way since its beginning in 1968. As the launch of the 50th birthday of Auroville coincides this week, I am tempted to write this as a ring side viewer of Auroville (or some parts of it) and its several developments since almost 2 decades now. "What is Auroville?" is an interesting question that is often posed by people who come to Auroville and depending on whom it is posed to, it elicits various types of responses. I have often been asked this question and my response has evolved over a period to currently be this, "Auroville is a congregation of 2000 journeys, journeys that people from different parts of the world have started with a quest for something", the journeys and the congregation, the acknowledgement of the charter and the acceptance of all these people to live along side others with their own quests is what defines Auroville today. Now, this may look like a stretch, after all everyone is on a journey, and, people congregate in every city and town, and, after all, they DO live with each other or somehow manage to tolerate each other, don't they? But, that is where the community and the charter comes in, Auroville is NOT a habitat alone, it is a place MEANT for people whose quests are beyond the material and immediate needs. 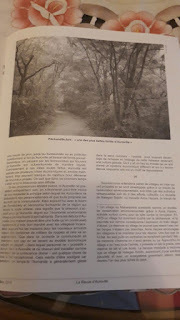 The charter in a simple language places a very high ideal for the co-existence, in its simplicity it is elegant, in its vision, very ambitious and in its scope, rather broad and providing space for creativity. Divine Consciousness, Unending Education, Bridge between past and future, embodiment of an actual human unity...are all terms that can have many interpretations and I can vouch that there are several in Auroville as well. But, it draws the contours of what a community of people in journey can and cannot embody. It doesn't say what they can and cannot DO, it rather states, whatever they do HOW and in what spirit the same is done. What is done is left to the community as a collective and of course, there are disagreements and bitterness based on the same, some of which is carried within human hearts for several decades. So, What is there to celebrate when a community such as this achieves 50 years of existence? One can name perhaps 50, but, I choose to name just 5 that is enough to celebrate. 1. I do think it is a marvel that such a community comes together at all with the sanction and support of the State anywhere in the world. There is no other such intentional community anywhere in the world of this size or with such a broad scope. Western society produces successive generation of disillusionment since over 100 years, if someone got disgusted with colonization and its injustice, someone else got disgusted with the advent of modern science, someone else with religion, modern technology, an idea of civilization, uniformity of civil life, absorption of individual life into a global economy, destruction of environmental wealth, perpetration of 'development' as neo-colonization agenda...there are enough reasons and while many in these societies have struggled and fought these in their own spaces, others, have dropped their national, social and cultural spaces to travel elsewhere in search of such spaces where they can create some other form of society far more meaningful for their own selves and others as well. Such spaces have emerged in different parts of the world as individual and collective enterprises of various longevity and capacity to survive. But, to have the approval and support of the State machinery is something that not many western societies could have tolerated in the previous decades, and definitely not now. This is for me a cause of celebration in the first place. Alain Bernard, a senior Aurovillian often says, "Auroville could only be possible in India, there is something about this soil that welcomes people and gives them a home". 2. That such a community continues to live and work by the spirit of the charter after 50 years with the chief visionary no longer in the picture within the first few years of its formation is another reason for it to be celebrated. Across the world, spiritual and cultural institutions of various kinds have been created by visionaries that have hardly managed to survive the life of the visionary, some have managed to survive for a few years afterwards and very few of them for even a decade. Modern Indian spiritual institutions tend towards dilapidated existence once the spiritual guru or visionary is out of the scene, there are a few exceptions. 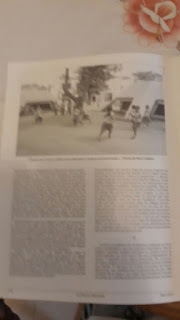 To that extent, Auroville without any visible visionary to "lead" the community has survived with such diverse people and cultural backgrounds, in a space that is quite alien to many of them, and done so for 50 years, is a cause for celebration. 3. One of the hangovers of colonization in India has always been the assumption that somehow if there is a settlement in India with westerners, then they must be getting money and other forms of support from abroad. This assumption permeates across the Indian social fabric and Auroville has seen a wide variety of these. I can personally testify the diverse manifestation of this assumption - from the local village trader trying to elicit an extra rupee from the uninformed traveller to the government official or politician who challenges why Auroville needs government funds to that of technocrats who feel that Auroville is unfairly subsidized. To the contrary, Auroville has had several funding crises and continues to stumble as a community from not having adequate funds to often support any new venture. There were early days during which it was far more difficult we have heard. To agree as a community that "Aurovillians will not possess anything and everything will be in the name of the community" could have been perhaps a bit easier if the community had very little. However, today with the booming Pondy and ECR economy means that there is an increasing pressure on Auroville to reconcile with its own land and assets value in the current market and also to reconcile to the "tourist" rates for every service that its inhabitants seek. A house in Auroville during the early days could have been a casurina shed that one can construct with the local villagers in a day with very little money spent and only local resources. Today, houses in Auroville for new comers run into hundreds of thousands and are increasing in cost. 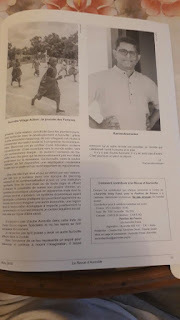 That the community has still sustained the economic model that it started to experiment with, whereby no one can "own" any assets in Auroville and everyone has to work as the servitor of divine consciousness is something very difficult. This calls for celebration, humanity as a collective has been heading the other way continuously with individual greed and aggrandizement of wealth and its vulgar show-off, becoming a global culture. That there is a place which sets for itself a different economic culture and lives by it for 50 years is a great reason to celebrate. 4. Often we get to hear of villages across India that have all developed and prospered due to the environmental rejuvenation work undertaken by remarkable individuals and collective efforts, Ralegan Siddhi where Anna Hazare works, the work by Jal Purush Rajinder Singh in Rajasthan, the work of the Panchayat leader Popatrao Chawan in Maharashtra, etc., have all been profiled and celebrated as unique and inspiration models. Due to its own self-criticism, Auroville often fails to realize the environmental resource base it has created for the entire region around Auroville and the economic wealth that has resulted because of it. 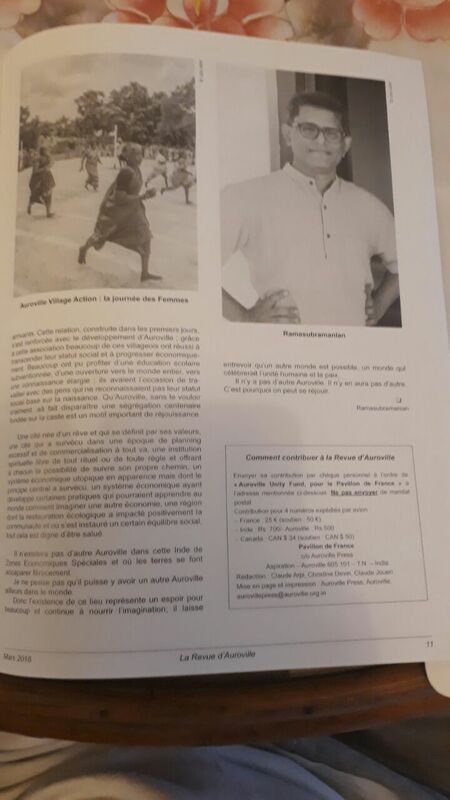 About 5 villages around Auroville have more than 80% of their residents working in Auroville based or Auroville inspired initiatives and endeavours, and, more importantly, these are people who don't want to leave the village and go elsewhere! Joss Brooks, the steward of one of the most beautiful forests developed in Auroville, Pitchandikulam often points out to the 20 odd saw mills in the region around Auroville that are kept in business because there is enough wood that needs to be processed today that comes from the management of the forests that have all been created. If one were to look further downstream, there are wood working units, carpenters of very high skill and several wood work ancillary units all around Auroville that have only originated because the early Aurovillians planted and conserved trees. The tree and timber is one example, there are several such traditional vocations and many modern ones that have emerged from Auroville and created wealth within the immediate surrounding villages. With a small population of around 2000 people, Auroville is directly influencing the economy of at least 2000 families in the immediate region around. More important today, these efforts are sustainable because they have emerged due to the natural resources. Such economic impact by a community on its neighbourhood without polluting or contaminating the resources around in itself is worth celebrating. 5. Once a politician in Pondichery, in a conversation mentioned, "these early Aurovillians without realizing have contributed to the social betterment of the most marginalized communities in the area". He went on to state that when early Aurovillians settled, they started to work on the land and planting trees. At that time, the only people who would work with them would be the most marginalized communities in the local area as they were the manual labourers and could relate and help with the work of the new settlers. These relationships that were built in the early days became even more stronger with the growth of Auroville and many of them also could overcome their own social status and gain economic advancement through the association. Many gained through subsidized school education, exposure to international knowledge streams and processes and also opportunity to work with people who didn't recognize their social status based on their birth. Such contribution that unintentionally overcomes a century old social segregation in the name of caste among the communities is an important reason to celebrate. A city that came about through a dream and gets defined by its values, to survive with government and community patronage in an era of excessive planning and space as an economic value alone, a spiritual institution that is truly free from clutters of rituals or norms and provides for a freedom for each person aligned to pursue their own path, (sounds like) an utopian and impractical sounding financial model that has survived in its core and developed several practices that can teach the world another imagination of organizing economy, an ecological region that has created conservation linked positive impact on the community around apart from social balancing as well, all of these are worth a salute and a celebration. There is going to be no other Auroville created in an India of SEZ and land grabbing due to greed and if it is not created in India, it may not be created anywhere else in the world. So, among several kinds of designed world imaginations that dominate, this space on earth gives hope for many and continues to sustain another imagination of a world possible, a world that celebrates human oneness and peace. That is a cause for celebration! There is no another Auroville and nor will be, so, let's cheer and celebrate. 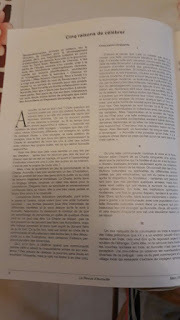 subsequent to this note being published in this blog, it has been translated and reproduced in the French magazine La Revue D' Auroville in May 2018. 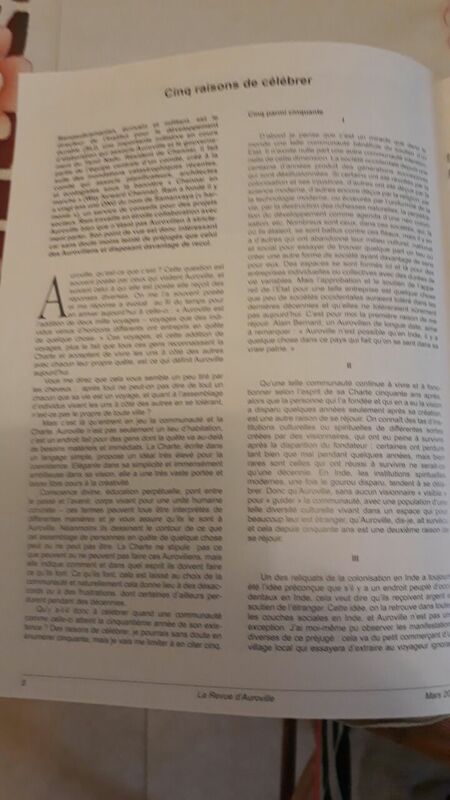 Images of the French translation below.